Large suckering shrub, also sometimes grown as a small tree by grafting onto a rootstock of R. pseudoacacia. Loose habit with brittle branches, green pinnate leaves with 7 to 13 small rounded leaflets. 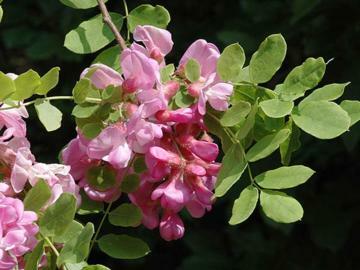 Fragrant, drooping clusters of rose-pink pea-shaped flowers in late spring and early summer. Bristly dark red-brown seed pods. Best in moist, well drained fertile soil, but tolerates poor soils and drought. Full sun.